Portland Never Looked So Good! 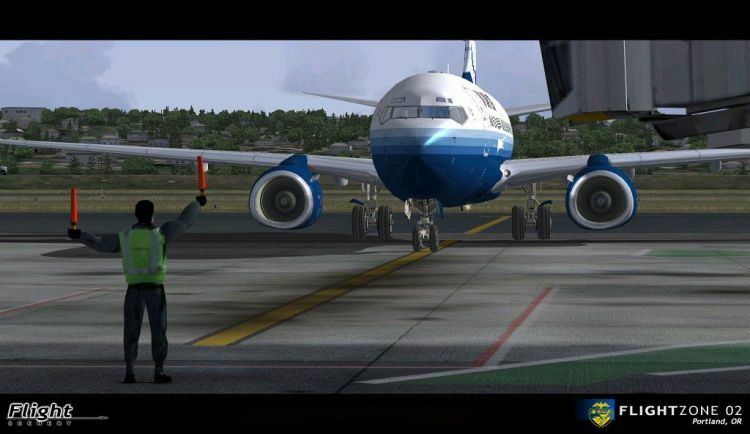 FlightZone is a new breed of Microsoft Flight Simulator add-on. 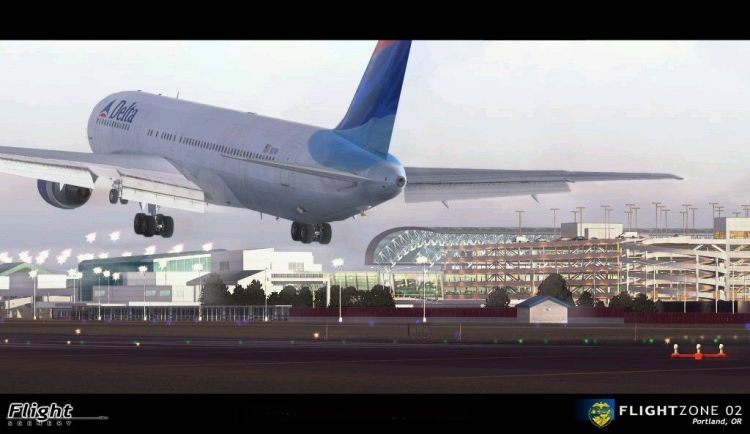 It is a photoscenery product and it is also a detailed multiple airports scenery. Along with three highly detailed photorealistic airports and broad photoscenery coverage, this product includes a high resolution 18m. mesh, reworked coastlines and a custom landclass/waterclass. 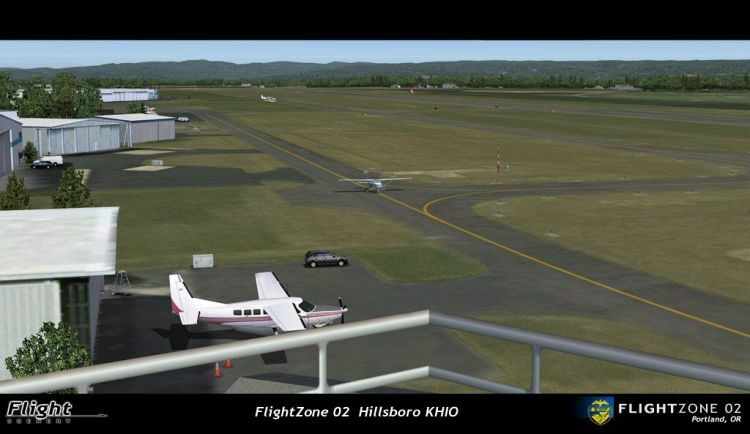 FlightZone 02: Portland is an integrated approach, recreating a complete flying environment in which both GA and commercial pilots can enjoy flying. The scenery is built in concentric areas, each one adjusted to a level of detail that is in relation with the flying experience. Created entirely with GMax and the latest Microsoft compilers, this scenery was made by a real life pilot and is totally aimed at recreating the feeling of being there. It has been optimized to keep very high framerates while giving maximum visual impact. 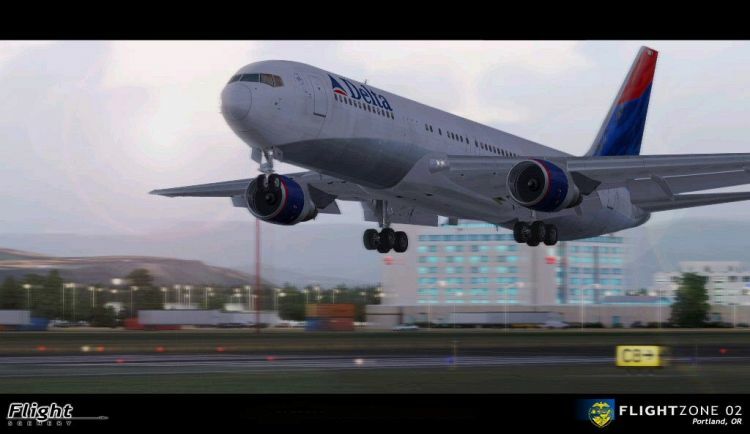 FlightScenery products are all about balancing visual cues and details with framerate to make it "as real as it gets". The "outer" area is made of a reworked coastline, mesh, landclass and waterclass. This area covers the greater Portland region and gives a satisfying visual cue for higher flight altitudes. This "outer" area then merges with the "middle" area, the photoscenery. 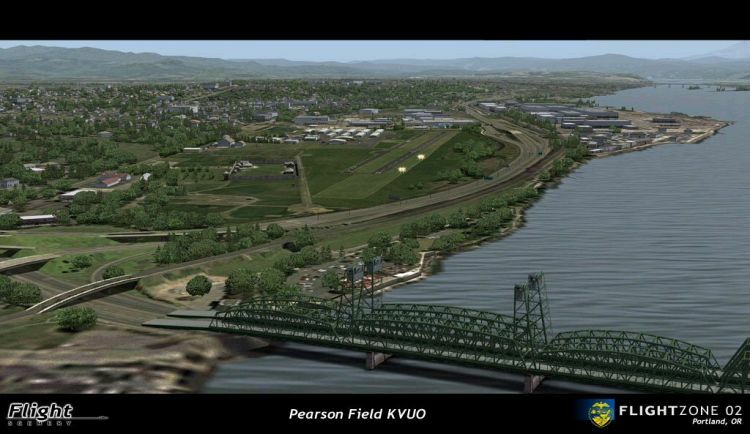 This photoscenery was made from very high resolution USGS aerial photographs (not satellite), which have been extensively reworked to "blend" seamlessly in the Flight Simulator environment. All five variations are represented: spring, summer, fall, winter, and night. Furthermore, custom autogen is fully implemented for the whole photoscenery. That's more than 1,000,000 carefully-placed houses and trees, added one by one. Major VFR references are represented also. This area is quite large and sets the environment for the third area, the airports. Enter the "inner" area: the airports as seen on approach and in traffic pattern. 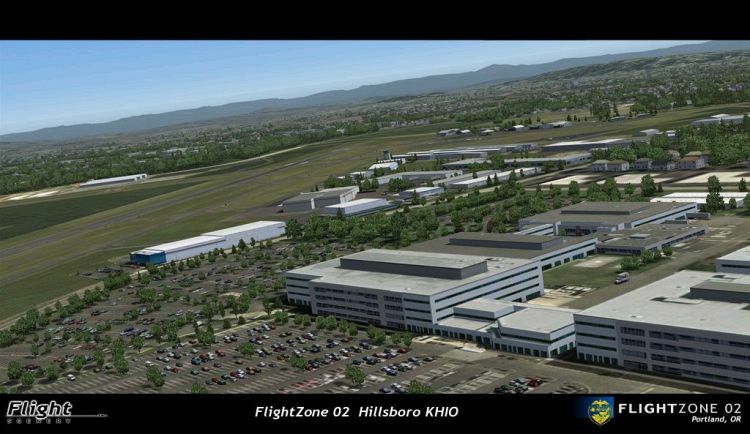 Each of the three main airports (KPDX, KHIO and KVUO) are seamlessly and completely integrated with the surrounding photoscenery. The ground textures are made from USGS very high resolution aerial photographs. There are no repeating textures, the whole field is there, in photographic precision, as seen in real life. The airport ground textures also change with the seasons and look radically different as time goes by, just like the photoscenery. As one gets closer to the airport, even more detailed visual cues start to come in view. 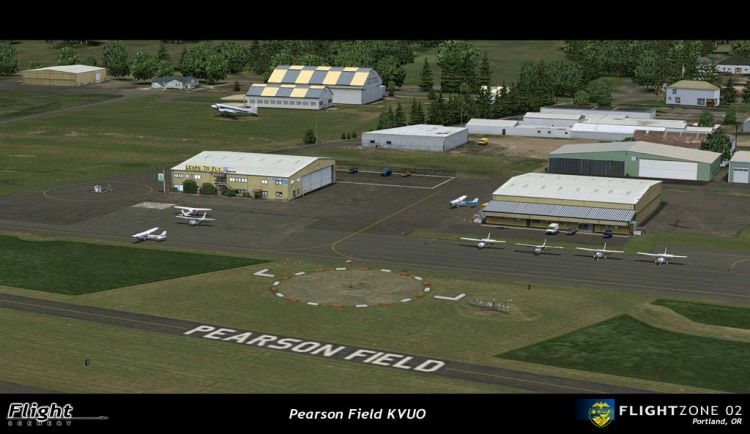 Again, in the spirit of providing visuals that are aimed at augmenting the flying experience, the runways are made from high resolution photographs and are also surrounded by grass. Why? The pilot's goal on short final is to integrate the speed and attitude of his aircraft while maintaining visual on the fast approaching runway. In real life, in the last seconds before touchdown, the pilots don't integrate these variables by looking at the instruments, the scenery "becomes" the VSI and Airspeed indicator. Because of the way default scenery is made on FS, and also because of the inherent shortcomings of looking at a screen instead of being in a plane, that "feeling" of speed is something we have always felt was missing. These few seconds before landing are what gets us ticking, hence the grass and a multitude of little details (taxi poles, sticks, etc. ), all there to bring back a bit of that sense of speed into Flight Simulator. Once landed, you'll find a good amount of details on and around the taxiways, including whatever hangar/building/terminal to which you are going. Gates have accurate parking codes, allowing AI aircraft to park properly. There are different levels of complexity at the airports, controlled by the complexity setting of Flight Simulator. Airports included (fully detailed): KPDX Portland Intl. 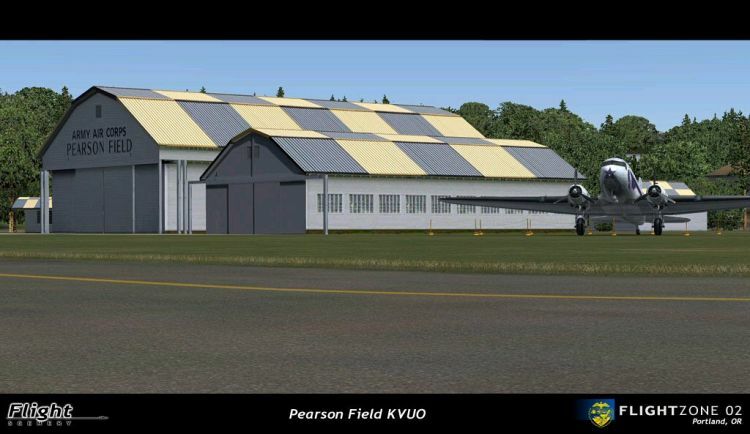 (Commercial, GA and Military use), KVUO Pearson field, WA (GA) The oldest airfield in the US, with a nice museum, and KHIO Portland-Hillsboro (GA). 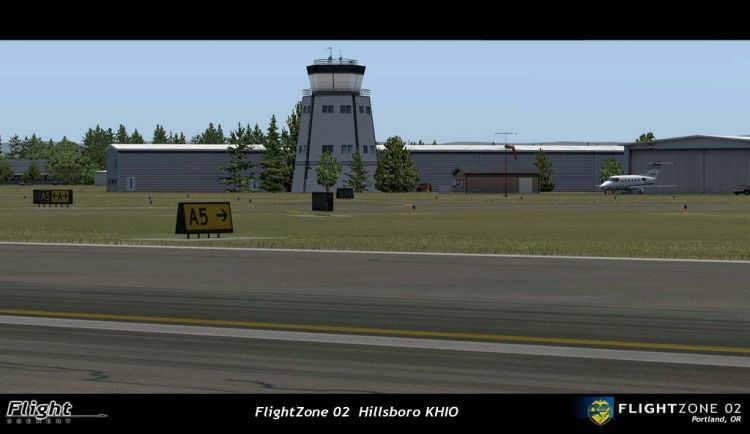 Reworked airports and strips: KTTD Troutdale, OR (GA) (Hires ground photo, runways/taxiways, 3D buildings), More than 20 strips around KPDX (corrected elevation, flatten, etc). Downtown Portland's main buildings remodeled, including two helipads (on top of US Bancorp Tower and World Trade Center buildings). Photoscenery included: Approx. 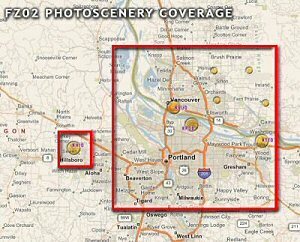 1,500 sq.km, from Battle Ground (WA) to Milwaukie (OR) and from Hillsboro (OR) to Troutdale (OR). All four seasons and night, full autogen. 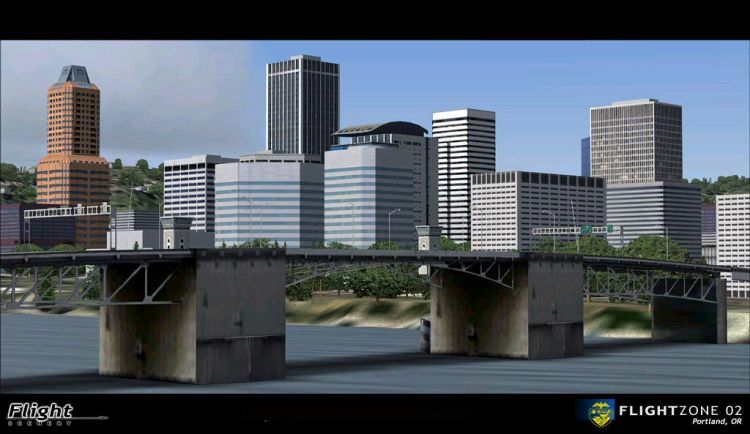 Animations: Road traffic around the main airports, animated marshallers and wing walkers at KPDX, animated wig-wags. Coastlines/Streams/Roads/Railroads: Reworked in a 10,000 sq.km area around KPDX. Mesh: 100Mb ultra hires 18 meter mesh with multi-resolution. Fully compatible with any 'road', mesh, LWM/VTP and landclass third-party products, provided they are accurately positioned. The Flight 1 Software E-Commerce enabled download executable is about 330 MB in size. The purchase screen will appear when you run the executable. The servers do support Resume, however we do not recommend certain download managers because they can sometimes corrupt large downloads.